California's next gold rush is in full swing as energy speculators scout out new sites for utility-scale solar energy construction. Neither the energy companies, environmentalists, or policy makers seem to have set an efficient process for finding suitable locations for the competing demands, reflecting the immaturity of the solar rush. It's clear that the different stakeholders in the solar rush have not fully considered their own position, let alone the potential compromises that are needed for a positive outcome. The Mojave Desert Land Trust (MDLT) is persevering towards its goal of raising enough funds to purchase 955 acres adjacent to the northwestern portion of Joshua Tree National Park, deemed an integral wildlife migration corridor. The area likely hosts bobcat, desert tortoise, and bighorn sheep. MDLT's land stewardship and preservation efforts represent true grassroots efforts to conserve some of the most ecologically sensitive and important Mojave Desert habitat. The MDLT successfully raised funds and purchased land at Nolina Peak, also near Joshua Tree, in 2008. MDLT's efforts dovetail well with Senator Dianne Feinstein's California Desert Protection Act of 2010, which includes a proposed "Sand to Snow National Monument" that essentially extends preservation from western Joshua Tree National Park into the San Bernardino National Forest. Senator Feinstein's office released more details on her proposal to create two national monuments in the Mojave Desert on her official site. In the press release, the Senator lays out policy implementation that balances the need to preserve desert wilderness, and scenic vistas along the iconic and Historic Route 66, and reconciling this with the need to make the renewable energy siting question more efficient. The California Desert Protection Act of 2010 summary also lays out plans to designate an additional 250,000 acres of wilderness area on lands previously designated as wilderness study areas. According to an article in the LA Times (link below), Senator Dianne Feinstein revealed more details regarding her proposed legislation that would set aside additional Mojave Desert land for conservation as Mojave Trails National Monument and Sand to Snow National Monument. The legislation would also establish current off-road vehicle areas as permanent. Feinstein estimated that passage of the legislation would occur in late 2010 at the earliest, and the LA Times noted that the territory would include 19 areas sought after by energy companies for solar and wind development. 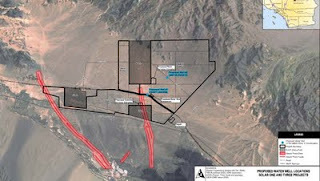 Finding a location for industrial growth in the Mojave that provides the most public benefit with the least impact is always the key challenge, and one discussed in other postings on Mojave Desert Blog. It's unfortunate, then, that the Beacon Solar Energy Project proposed near California City in the Northwestern Mojave is running into a seemingly obvious hurdle. The project's proposed site is perfect from a biological standpoint -- the land was previously used for agriculture and has little value as habitat. Developing this land (approximately 2,000 acres) would not deprive endangered species of key habitat but would provide up to 250 MW of renewable energy. So what's the hold-up? Water. The developers want to used cooling technology that requires vast amounts of water. If built as proposed, the California Energy Commission estimates that the solar project would use 1400 acre feet per year, which is equivalent to about 456 million gallons. One of the goals of the National Environmental Policy Act is to consider the long-term effects on our country's natural resources, and the Environmental Impact Statement process being carried out for multiple utility-scale solar energy projects in the desert should account for the long-term impact of each project under consideration. 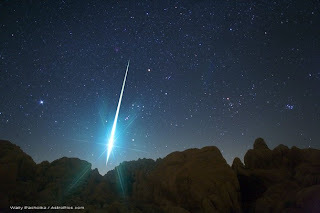 Given that the current applications for use of desert habitat in California total over 500,000 acres, the long-term impact on the Mojave Desert as a place to live, visit or enjoy will be considerable even if only a fraction of these are approved. The BrightSource Energy Company and various environmental groups continue to contest the impact that the proposed Ivanpah solar site will have on Mojave Desert wilderness. 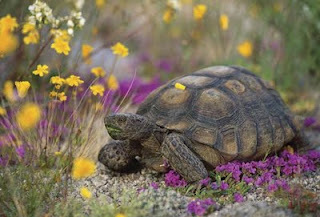 A cursory review of BrightSource's testimony to the California Energy Commission (CEC) argues that the designated location for the solar plant is not listed as premium Desert Tortoise habitat. This claim likely rests on dated information from much broader territory surveys and ignores the biological surveys conducted on the designated site over the past year, which have in fact identified significant biological resources, including at least 25 desert tortoises.